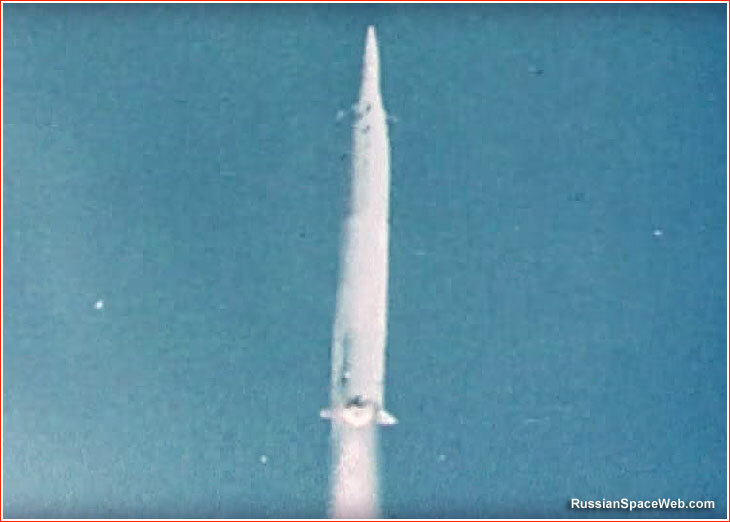 The R-5 medium-range rocket, became the first "strategic" missile in the Soviet fleet, capable of flying beyond 1,000 kilometers and carrying a nuclear warhead. Launch of the original R-5 missile. 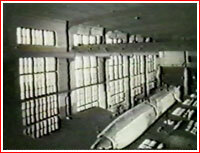 The development of the R-5 missile started at Sergei Korolev's OKB-1 design bureau, as an intermediate step toward the more ambitious R-3 project. The active phase of the design work on the R-5 took place in 1952. 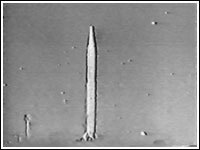 This single-stage missile was designed as a 20-meter tall cylinder instead of cigar-like shape common for previous A-4-derived rockets, such as R-1 and R-2. For the first time, both fuel and oxidizer tanks welded from light aluminum and magnesium alloys were made as monocoque structures yielding great weight savings. The riveting was used for the assembly of the tail section made of dural and aluminum. The tail section also carried short triangular fins with wind rudders instead of bulky A-4-derived stabilizers of the R-1 and 2. Still, resemblance to the A-4 has been retained in the propulsion unit. The R-5 was powered by a single A-4-derived engine, developed in OKB-456 in Khimki under designation RD-103. It used a 92-percent mix of alcohol with water as a fuel and liquid oxygen as an oxidizer and yielded trust of 43.8 tons. Comparing with the A-4 engine, RD-103 featured a number of improvements including better cooling system for the combustion chamber and introduction of automated trust control. Solid catalizator was used for decay of hydrogen peroxide in the gas generator, which provided hot gas to drive the turbopump on the propellant line. The centrifugal pump was used to drive the hydrogen peroxide into the gas generator. Elastic fuel lines were also used for the first time. The R-5 flight control system included aerodynamic and gas rudders, which prevented the rocket from rolling about its main axis. After the engine cutoff, the stabilization would be still maintained using the oxygen gas which during the active flight served for pressurization of the oxidizer tank. 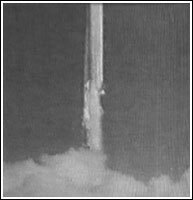 To achieve this, the pressurization gas was directed into the system of nozzles placed in the conical section, connecting the warhead with the rest of the rocket body. 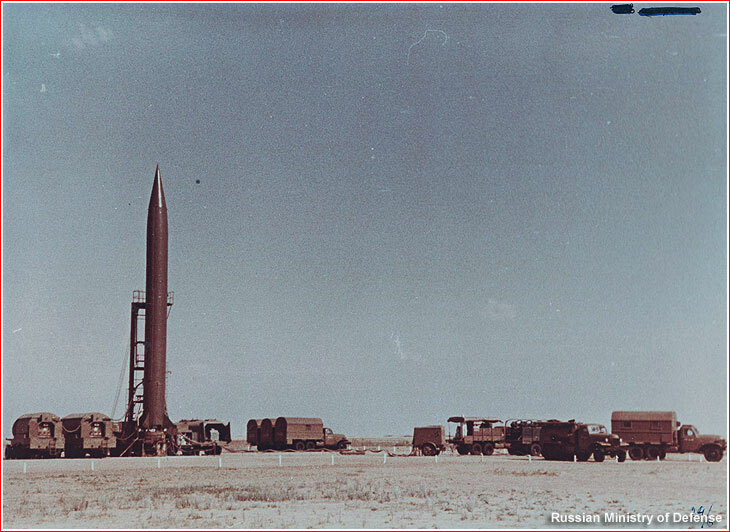 Weighing 28,570 kilograms at launch, the R-5 was able to strike targets 1,200 kilometers away, becoming the first "strategic" missile in the Soviet arsenal, because it crossed the 1,000-kilometer range. One version of the R-5 was designed to be equipped with two or four strap-on warheads attached to the middle section of the vehicle. 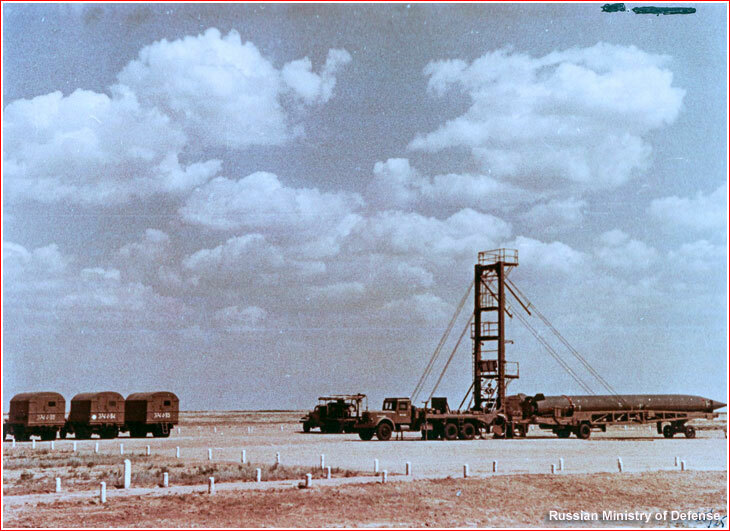 The missile testing had started in Kapustin Yar on March 15, 1953. One of the problems testing crews faced at the time in Kapustin Yar was a fast-growing population of rats. 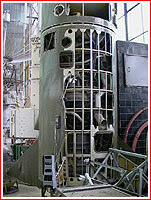 Some even managed to snick into missile interiors, damaging wiring and other elements. In addition to repairing storage buildings, the range personnel started adopting cats, who eventually helped repulse the "invasion." A modified version of the R-5 missile, designated R-5M, was developed to carry a nuclear warhead. 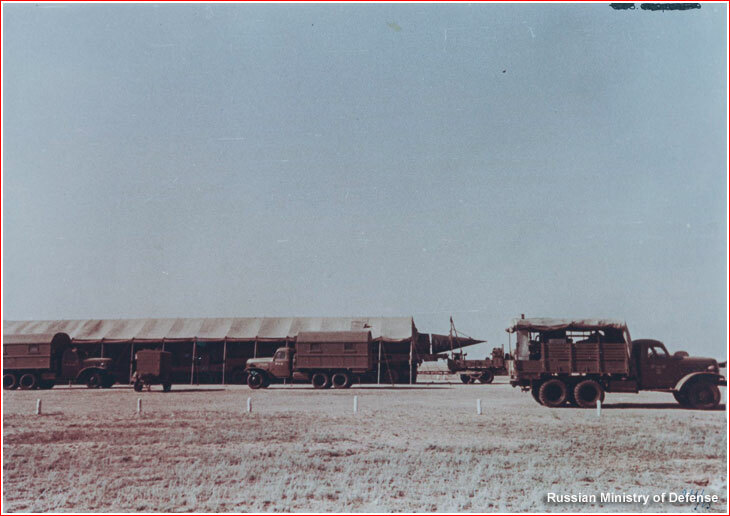 A nuclear-capable R-5M missile in one-hour readiness for launch. 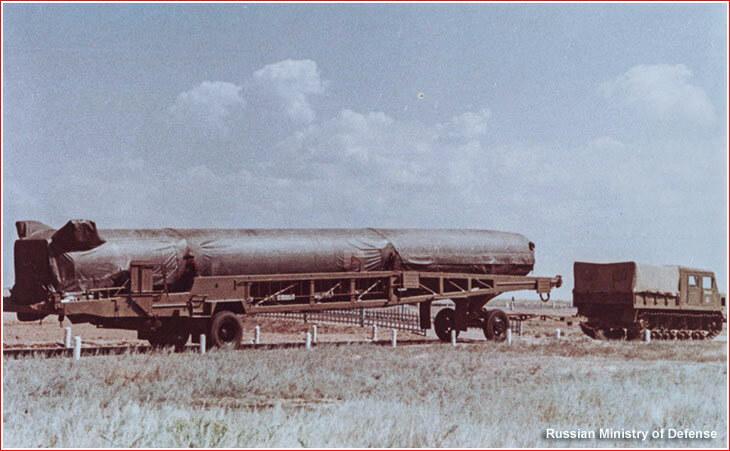 The R-5M missile on the transporter. The R-5M missile is being integrated with its warhead. 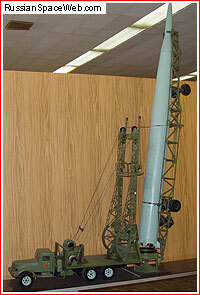 The R-5M missile is being prepared for the installation on the launch pad in Kapustin Yar. R-5M missiles during a parade on the Red Square in Moscow. 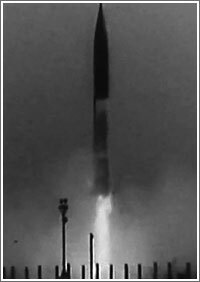 The reseach version of the R-5 rocket, designated R-5A, was also developed and launched on vertical trajectories. The vehicle included a payload section which could separate from its booster and return back to Earth with a help of a parachute. 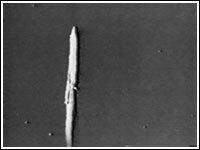 On March 27, 1958, the USSR announced the launch of a rocket on February 21 to a record-breaking altitude of 473 kilometers, followed by a return back to Earth. 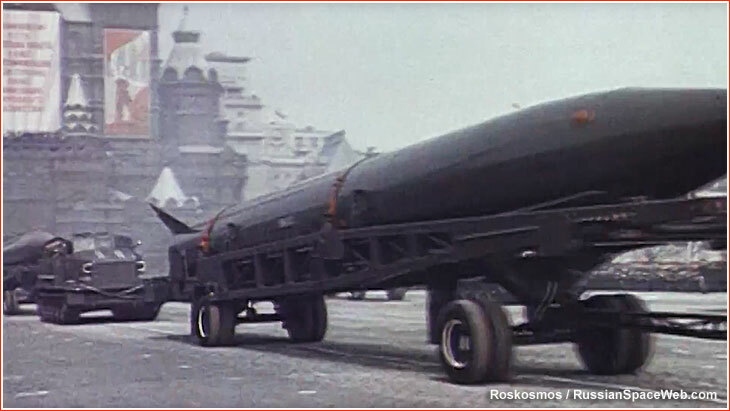 Although the designation of the rocket was not disclosed at the time, the Soviet press did release a photo of the vehicle. Launch of R-5M missile. Notable is the frost covering the cryogenic oxygen tank of the vehicle. Click to enlarge.